­13:19 GMT: We are wrapping up our LIVE updates from the rally. 13:15 GMT: Large-scale opposition rally in central Moscow finishes without incident, police officials report. 12:34 GMT: Thunderstorms and heavy showers disperse crowds at Akademika Sakharova Avenue, opposition rally draws to a close. 11:59 GMT: Opposition leaders finish addressing the crowd, and popular Russian rock musicians take to the stage. 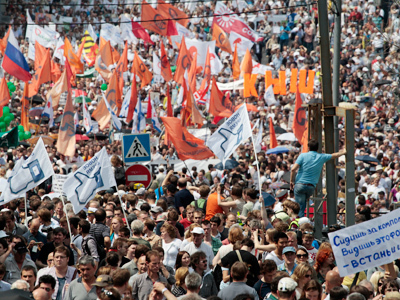 11:34 GMT: Some opposition supporters have left the rally, but most still remain on Akademika Sakharova Avenue. Meanwhile, a similar event has started in St Petersburg. 11:23 GMT: A protester has fainted at the rally and was taken away by the medics stationed on the site. 10:56 GMT: Sergey Udaltsov proposes another mass rally on October 7th, which will coincide with Vladimir Putin's birthday. 10:30 GMT: Opposition leaders have started addressing the crowds. First man up on stage is Sergey Udaltsov, leader of the 'Left Front' movement. 10:13 GMT: Most of the protesters have reached Akademika Sakharova Avenue, no reports of violence, violations or arrests. 09:53 GMT: First protesters reach Akademika Sakharova Avenue, where a stage has been set up and a concert is scheduled for later in the day. 09:18 GMT: Protesters continue to move down the boulevard, still separated according to political views – leftists on the left, right wing on the right. People are calling for a Russia without Putin, and chanting "What solution? Revolution!" 09:15 GMT: Moscow police confirm up to 10 000 people taking part in the rally. 09:00 GMT: The march has officially begun; the rally will make its way down the Boulevard Ring and end the event on Akademika Sakharova Avenue, the site of the first major opposition rally in recent years that took place in December. 08:57 GMT: Police on the scene are directing the protesters, asking left-wing activists to stand on the left side of the Strastnoy Boulevard, and the right wing on the right. So far, this logical approach seems to be working out. 08:50 GMT: So far, the protesters are a motley crew – students, left-wing activists, nationalists, LGBT activists. Estimates on location vary, but most seem to agree around 5 thousand people have arrived so far. 08:33 GMT: Organizers say nearly 20 000 people have already gathered in the city center. Around 50 000 are expected to attend. 08:24 GMT: Organizers of the rally are handing out white ribbons, which have become a sort of a symbol of the opposition movement. 08:20 GMT: Hundreds of police officers are on duty and will be posted along the route of the march. 08:14 GMT: Protesters have an hour to gather and the march itself is scheduled to begin at 1300 Moscow time, or 0900 GMT. 08:01 GMT: People are gathering in Pushkinskaya Square in the heart of Moscow, but heavy showers are forcing them to seek shelter. 08:00 GMT: Russian opposition supporters are holding a demonstration in Moscow. The so-called “March of Millions” is expected to attract thousands to the center of the capital. RT will be providing live updates from the event, and you can watch the live feed here.